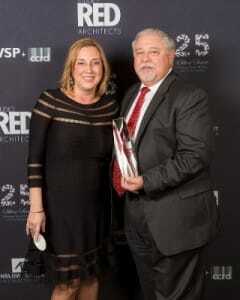 Houston, TX – October 28, 2015 – Freddie Bustillo, Vice President for Gilbane Building Company, was recently honored by the Society for Marketing Professional Services (SMPS) with its Hall of Fame Award. SMPS Houston bestows this honor to those who have been recognized as the “Best of the Best” among their peers in the A/E/C marketing industry. This award recognizes those individuals who have a long, rich history of success in the Houston built environment and have made a significant, indelible impact on professional services marketing and the Houston chapter of SMPS. Gilbane Building Company provides a full slate of construction and facilities-related services – from pre-construction planning and integrated consulting capabilities to comprehensive construction management, close-out and facility management services – for clients across various markets. Founded in 1873 and still a privately held, family-run company, Gilbane has more than 50 offices worldwide.